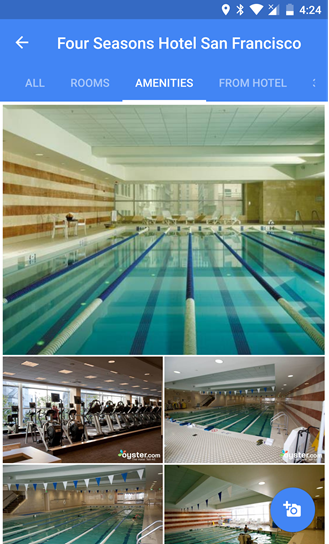 Google Maps began showing a simple list of amenities just over a year ago, but adding in pictures should take the guesswork out of how many machines can be found in the gym and whether the pool is big enough to swim laps or only suited for a little splashing. Most images seem to be provided by travel-related websites like oyster.com, but it probably won't take long before user-contributed shots make it into the page, as well. You can find the amenities page among the other sets of photos, just tap on a picture in the hotel listing and look at the row across the top for the album you want to see. Google triggered the new amenities photo page with a server-side switch in the last couple of days, but it works with Google Maps version v9.44.0 and above. If you're on an older version, hit the link below to grab the latest or hold on a bit longer for Google to roll it out to you.